We present a novel method to produce discernible image mosaics, with relatively large image tiles replaced by images drawn from a database, to resemble a target image. Compared to existing works on image mosaics, the novelty of our method is two-fold. 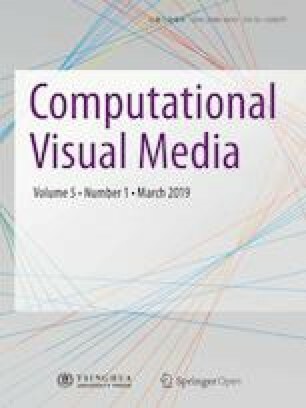 Firstly, believing that the presence of visual edges in the final image mosaic strongly supports image perception, we develop an edge-aware photo retrieval scheme which emphasizes the preservation of visual edges in the target image. Secondly, unlike most previous works which apply a pre-determined partition to an input image, our image mosaics are composed of adaptive tiles, whose sizes are determined based on the available images in the database and the objective of maximizing resemblance to the target image. We show discernible image mosaics obtained by our method, using image collections of only moderate size. To evaluate our method, we conducted a user study to validate that the image mosaics generated present both globally and locally appropriate visual impressions to the human observers. Visual comparisons with existing techniques demonstrate the superiority of our method in terms of mosaic quality and perceptibility. Pengfei Xu is an assistant professor in the Visual Computing Research Center at the College of Computer Science and Software Engineering, Shenzhen University. He received his bachelor degree in math from Zhejiang University in 2009, and his Ph.D. degree in computer science from Hong Kong University of Science and Technology in 2015. His primary research lies in human computer interaction and computer graphics. Jianqiang Ding is a master student with the Visual Computing Research Center at the College of Computer Science and Software Engineering, Shenzhen University. He received his bachelor degree from Harbin Engineering University in 2015. His research interest is in computer graphics. Hao Zhang is a full professor in the School of Computing Science at Simon Fraser University, where he directs the GrUVi lab. He obtained his Ph.D. degree from the University of Toronto, and both M.Math. and B.Math. degrees from the University of Waterloo. His research is in computer graphics with a focus on geometry modeling, shape analysis, 3D content creation, and computational design and fabrication. Hui Huang is a distinguished professor at Shenzhen University, where she directs the Visual Computing Research Center. She received her Ph.D. degree in applied math from the University of British Columbia in 2008 and another Ph.D. degree in computational math from Wuhan University in 2006. Her research interests are in computer graphics and scientific computing, focusing on point-based modeling, image processing, geometric analysis, 3D acquisition and creation. We thank the anonymous reviewers and the editors for their valuable comments. This work was supported in part by the National Natural Science Foundation of China (Nos. 61602310, 61522213, and 61528208), Guangdong Science and Technology Program (No. 2015A030312015), Shenzhen Innovation Program (Nos. JCYJ20170302154106666, KQJSCX20170727101233642), and NSERC (No. 611370). Wikipedia-contributors. Photographic mosaic. Available at https://doi.org/en.wikipedia.org/wiki/Photographic_mosaic. Rapid-Mosaic. Foto-mosaic-edda. Available at https://doi.org/fmedda.com/en/home.